One of the biggest fears people have of flying is the sensation of turbulence. Turbulence, as it turns out, is a completely unfounded fear. There have been a reported 0 commercial airline crashes due to the occurrence of turbulence. The equivalent of turbulence in investing is market volatility, and after a lengthy period of smooth flying we’ve experienced quite a bit of it in the last 3 weeks. But what is different between the perceived risk of turbulence while flying and market volatility, is that swings in the stock market can have a significant impact on your portfolio and it’s returns. Not to mention that when you’re flying you may be scarred sitting in your seat, but you have no real ability to go up to the cockpit and do something stupid that may endanger the flight. While in contrast when you see your portfolio go down 15% you have the very real ability to be overcome by your emotions, throw sound judgement to the wind, and do something silly (Like sell off all equity holdings straight to cash) that will have a significant negative impact on your portfolio. Over the last 30 years the SP 500 has grown in value over 393%*. That is a yearly average of 13.1% per year over those 30 years. That is an impressive vessel to create wealth and when you add compounding to that equation the results become even more compelling. The catch here is that the ride to capture all 393% of growth over that time was anything but smooth. Just like a flight from point A to point B there are going to be times of turbulence along the way. 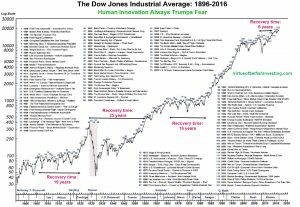 Below is a chart** of the Dow Jones Industrial average over it’s 120 years of existence from marketwatch.com. We can see that immense amounts of growth have occurred since it’s inception, but there have been times when the index dropped dramatically. When periods of decline happen to the stock market, our emotional decisions are not the only thing that can threaten us from achieving our goals financially. The actual decline in the market can be a very real threat that we need to be prepared for. If the stock market decides to head into a bear market just before you retire, the fact that you are not earning compounded growth for even just a few years while your portfolio is at its highest dollar value, can mean a significant drop in the ending value of your account at retirement age, as opposed to if the market had risen during those final years. This is called sequence of return risk and for a great deep-dive explanation of how much this can effect your portfolio, I highly recommend reading this article on the matter by Michael Kitces. A powerful way to combat the risks that volatility and bear markets can have on your portfolio is by utilizing the benefits of keeping a low Beta across your Portfolio. Beta measures how much a specific investment’s price moves relative to a benchmark market index, with 1 meaning an investment moves perfectly in sync with it’s benchmark. As an example, let’s say stock XYZ’s benchmark is the S&P 500, and XYZ has a beta of .5. If the S&P 500 went up 10%, XYZ would only rise 5%. Conversely, if the S&P 500 went down 10%, XYZ falls by only 5%. At Schrum Private Wealth Management, we use Beta as one of our criteria, among others, to create well diversified portfolios that are prepared to weather inevitable downturns in the market. This is just one tool that savvy investors can use in their belt to set themselves up for success during the inevitable times of market volatility. We can never predict exactly what is going to happen in the stock market, and if someone tells you that they can run away, but we can make decisions based from evidence and factors that have proven to be true over prolonged periods of time to prepare us for the road to financial success.